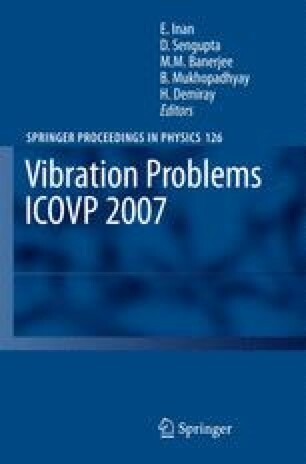 Free, out of plane vibration of a rotating beam with non-linear spring mass system has been investigated. The non-linear constraint is connected to the beam between two points on the beam through a rigid rod. Formulation of the equation of motion is obtained starting from transverse/axial coupling through axial strain. Solution is obtained by applying method of multiple time scale directly to the non-linear partial differential equations and the boundary conditions. The results of the linear frequencies match well with those obtained in open literature. Subsequent non-linear study indicates that there is a pronounced effect of spring and its mass. The influence of rigid rod location on frequencies is also investigated on non-linear frequencies of rotating beam.